Today's blog post comes to you courtesy of Tuna's new family. It sure makes it easy when adopters write the Happy Tail for us! Nature or nurture, the age-old question when trying to find that perfect pet for adoption. Our story began around 10 years ago when our adopted kitten ran away from home and while looking for her, our youngest daughter found another stray in the woods. “Sandi”, an orange tabby was probably around five and clearly, based on her cleanliness (or lack thereof) and waistline, had been roughing it in the woods for several days. Knowing that some poor family was probably desperately looking for her, we provided her with the bare water and food necessities (outside) and began a campaign to find her real owners. To make a long story short, after advertising and contacting shelters to no avail, Sandi, after over 2 weeks of camping outside on our doorstep, became our second adopted feline. Sandi immediately became part of our family with unmatched reciprocal affection. Now fast-forward to the fall of 2007, Sandi succumbed to what we believe was a stroke leaving behind a very sad family. How could we ever replace a kitty with such a wonderful demeanor and personality? One “smart” member of the family, whose name shall remain anonymous, thought it must be nature so let’s find a young female orange tabby cat – simple!!! Maybe a good idea but no luck. 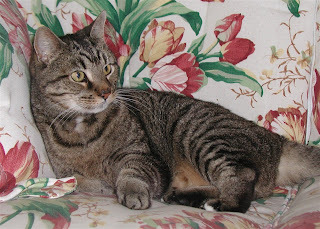 During the family’s quest to find the perfect kitty, we did come across a male tiger tabby at the Medfield shelter. But again, this hardheaded anonymous male member of the family thought this cat isn’t orange or female and therefore couldn’t be as warm and friendly as Sandi. Well “Tuna” proved that his male counterpart didn’t know cats from beans. From the moment Tuna entered our home and performed his cursory inspection of his new digs and met his new roommates (Kipp the black lab and Trixie the now middle-aged kitty), you could almost hear him purr his approval! After a few short days, much to his skeptic’s astonishment, his mannerisms were almost identical to Sandi’s always coming when called and playing round robin on whose lap to warm each night. So nature or nurture? Perhaps another “n” word is in order that being “necessity” for both a welcoming family to fill a void and an orphaned pet to find a loving home which seems to stimulate the very best traits in a kitty’s personality.